Europe understands that Donald Trump’s hate speech can become mainstream. Europe ignored the bigoted hate speech of the far right for a decade. Now it’s mainstream. 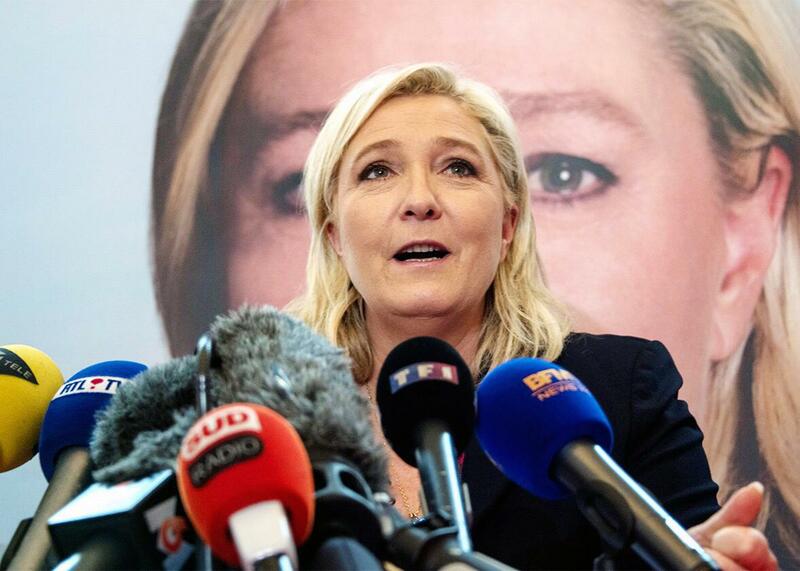 France’s far-right National Front leader Marine Le Pen holds a press conference in Lille, Dec. 7, 2015. Donald Trump wants America to shut its doors to Muslims. When a political candidate known for being a firebrand calls for a bar on Muslims entering the United States, there is a temptation to simply disregard the comment as outlandish—or as Jeb Bush, put it, “unhinged.” But there is a danger in not looking at hate speech as anything other than what it is. Europeans now understand this very well. Because Europe’s recent experience with extremist rhetoric suggests that Americans ignore Trump and his politically motivated bigotry at their peril. For much of the last decade, Europe’s mainstream media and political establishment treated the rise of far-right politicians as though they were anomalies—peculiar misfits on the margins of society that would forever remain on the sidelines. The British National Party, the Austrian Freedom Party, the Belgian Vlaams Belang (formerly Vlaams Blok), and others were regarded as nasty but essentially irrelevant to the national debates. Rather than wither on the edges of politics, these parties have increasingly taken up real estate in the political center—and even when the parties haven’t assimilated into the mainstream, their ideas have. Their members posit a simple and seductive narrative of a cultural war being waged against the forces of European civilization. The specter is nearly always the same: the imminent creation of a so-called Euro-Arabia and the destruction of European civilization through cultural degradation fostered by a fifth column of Muslims in Europe. All this seemed rather peripheral in the early 2000s. As such, mainstream political parties in a number of countries never saw a need to critique or tamp down these forces. At times, conservative politicians put distance between themselves and more radical groupings—but they failed to systematically reject the ideas of “Euro-Arabia.” The failure to expose the moral and logical flaws in the far right’s xenophobia has had repercussions that are sometimes sharp and at other time slow but pernicious. Whether or not Breivik would have found other fuel for his hatred is difficult to say. But it is clear that, left to fester, extremism has a way of taking hold and growing. The success of France’s far-right National Front, which won six of 13 regions in the first round of elections on Sunday, is an example of this. Part of the reason for that success is the failure of mainstream French parties to systematically denounce the ideas underpinning the Front, as well as their own failure to deliver on their promises. Czech President Milos Zeman attended an openly anti-Muslim rally on Nov. 17 –granting the organizers legitimacy as a result. Hungarian Prime Minister Viktor Orban has fueled anti-Muslim rhetoric in Hungary, bringing the radical ideas of the marginal fringe into the mainstream of Hungarian politics, while the radical right-wing party of Jobbik keeps feeding those ideas into the arena. In France, the National Front is now part of the political mainstream; in Hungary and the Czech Republic, it’s far worse. Not just particular far-right-wing parties but their ideas have become part of the mainstream. As U.K. Conservative Party politician Baroness Warsi put it, anti-Muslim bigotry has “passed the dinner table” conversation test, albeit to do with refugees rather than Muslims per se. Even British Prime Minister David Cameron, when discussing his country’s refugee issue, referred to refugees as swarms—dangerously approaching the rhetoric of the populist right-wing U.K. Independence Party. Prejudice against Muslims is no longer the domain of radical far-right groups; it has become acceptable from far more centrist political forces. If there had been more of an effort to challenge and expose the bigotry of these voices when they first appeared, it is likely that their messages wouldn’t have become incorporated into the realm of acceptable discussion. To some extent Germany—with its sensitivity to any kind of racism or xenophobia—is the counterfactual. But even in Germany, the existence of Pegida, a deeply anti-Muslim political movement, is worrying—and seems to be intensifying. It is unlikely that Trump believes that banning Muslims from America’s shores could ever become law. But that’s not the point. The damage has already been done because he’s changed the terms of the debate. When the leading candidate of a mainstream party can call for such bigoted policies, the center ground of American politics shifts. That makes it easier for anti-Muslim prejudice to grow even further within the mainstream, as it already has in Europe. There’s no good that comes out of that—and a considerable amount of bad.